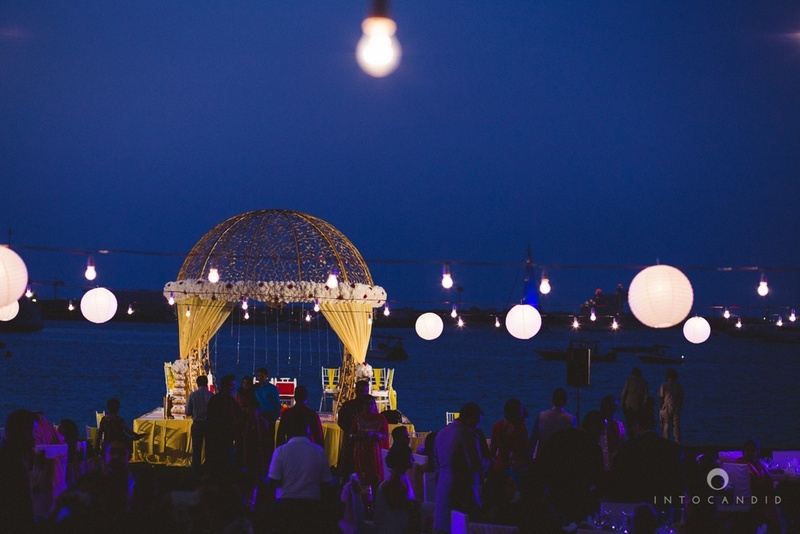 An absolutely gorgeous couple, a perfect wedding by the beach followed by a crazy Reception night ! 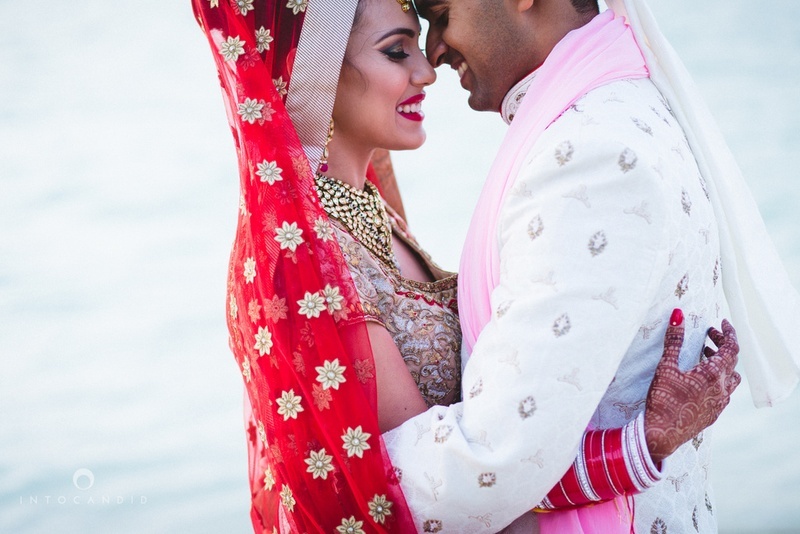 An absolutely gorgeous couple, a perfect wedding by the beach followed by a crazy Reception night the next day. 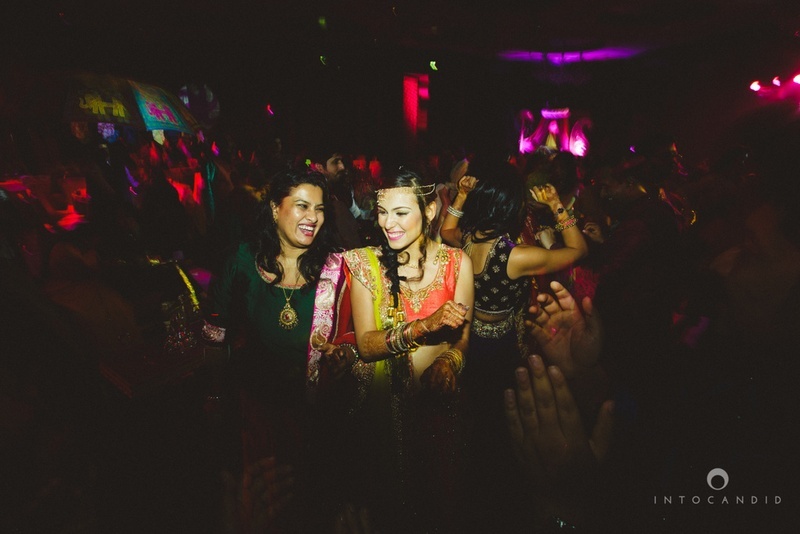 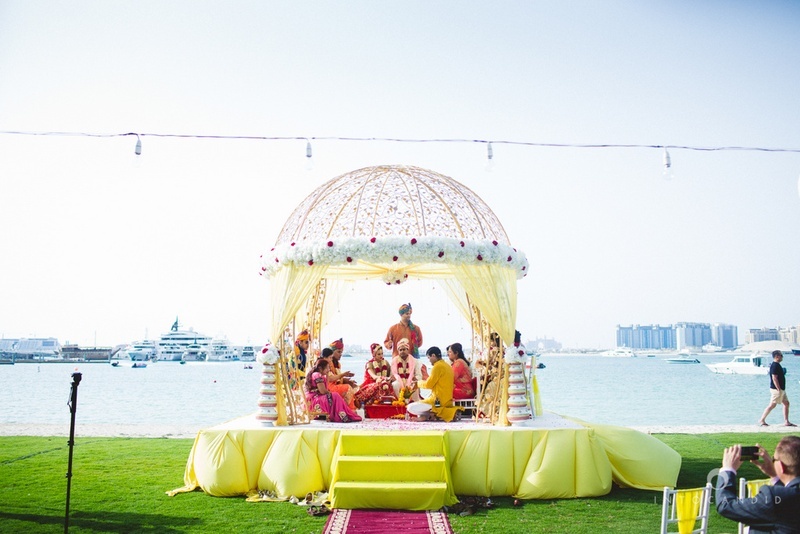 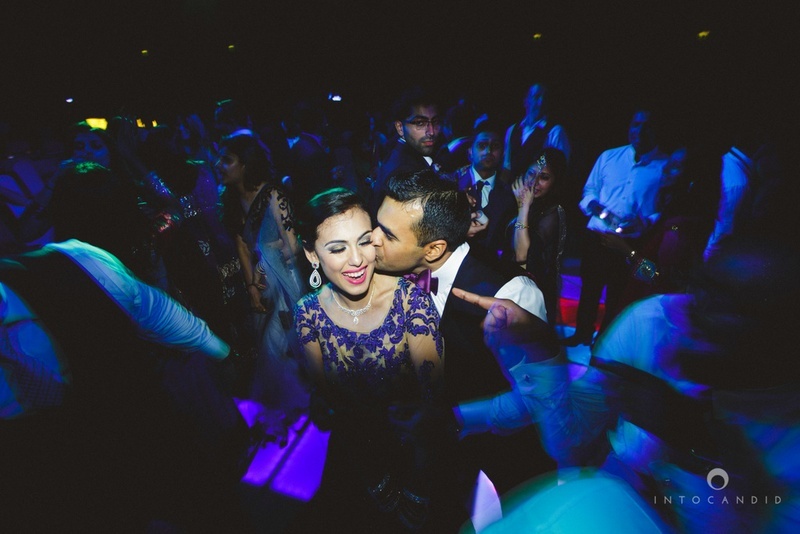 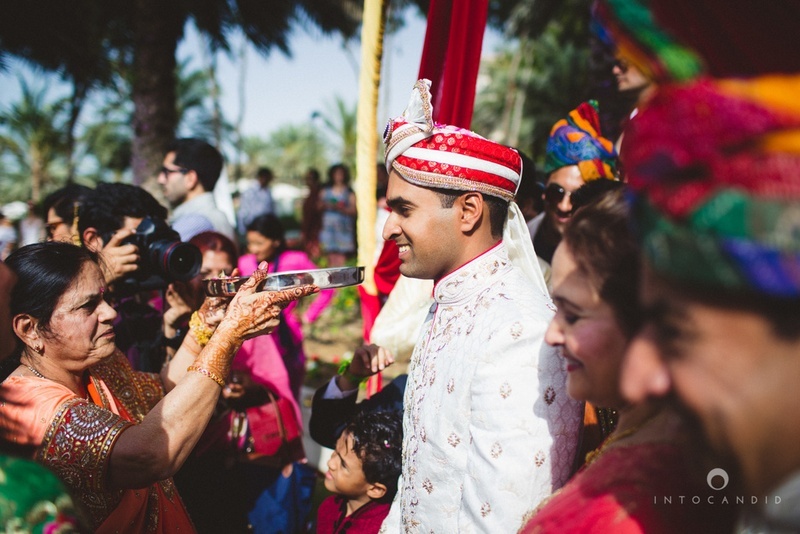 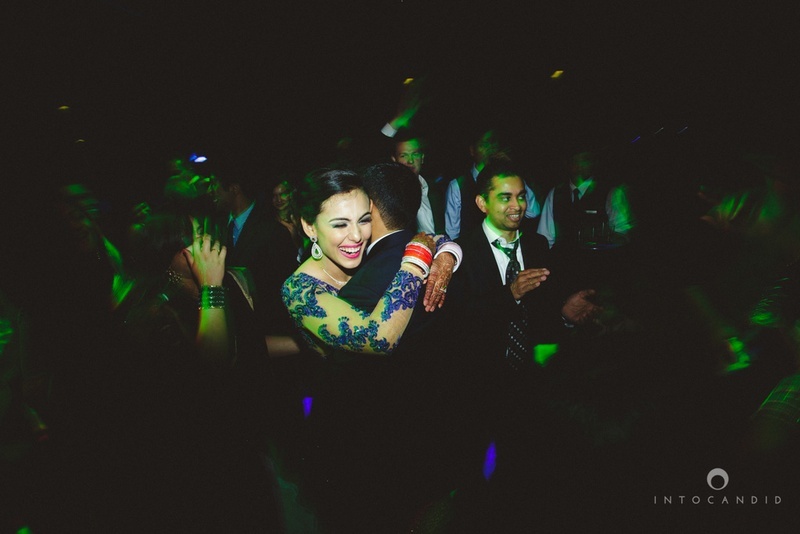 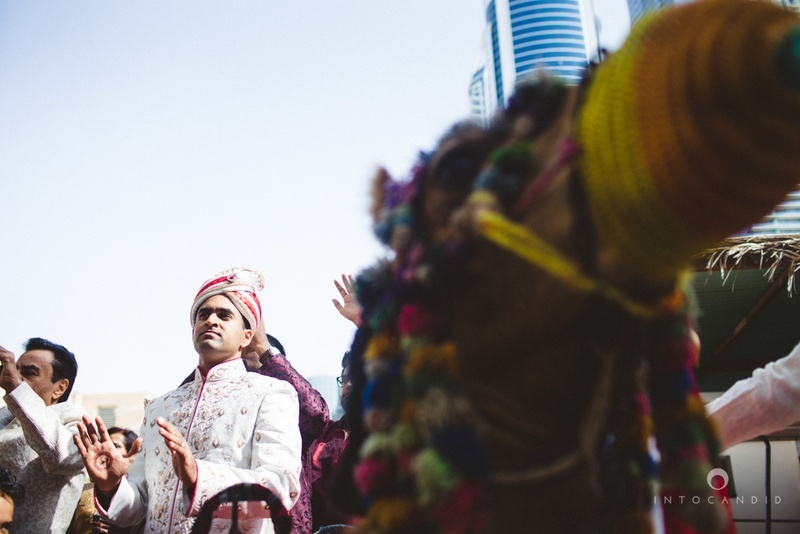 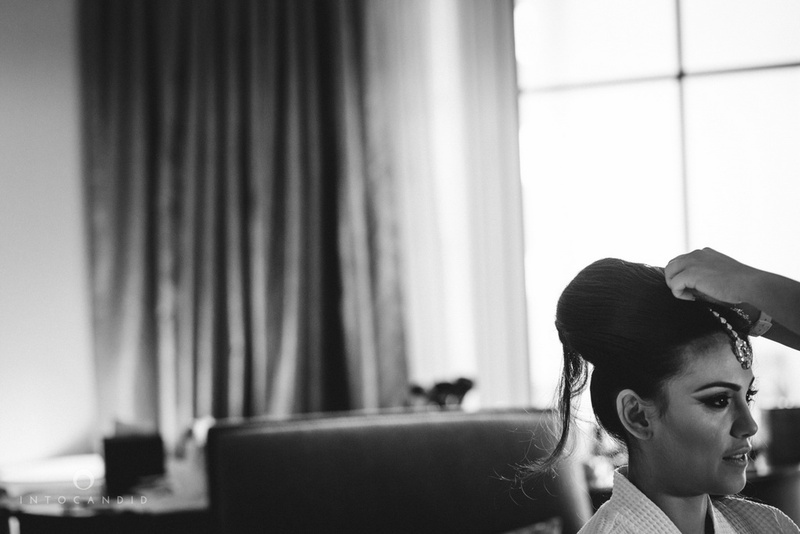 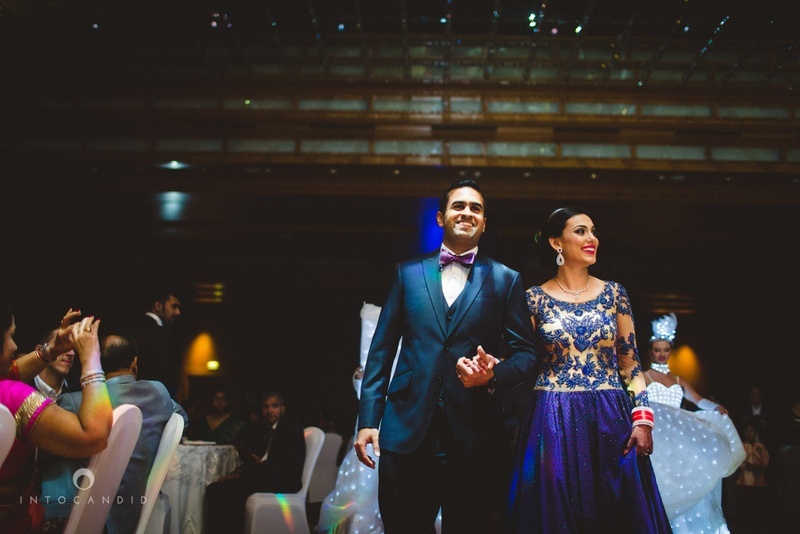 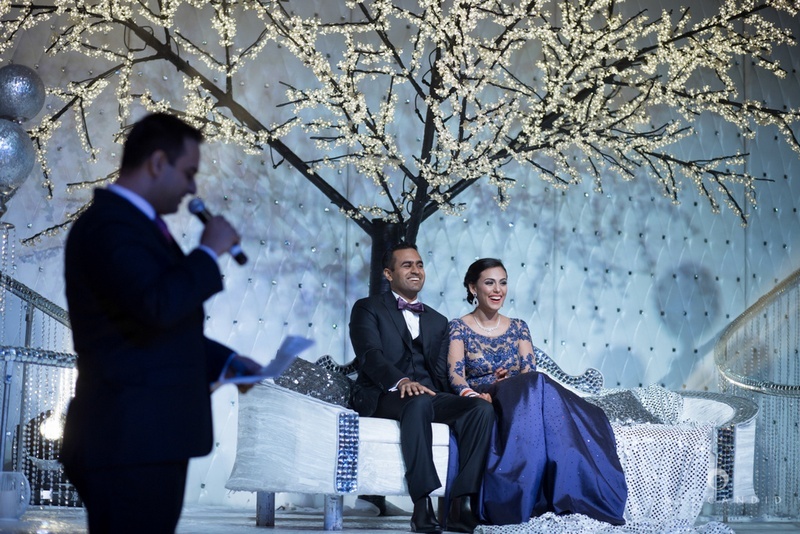 Priyanka and Rahul's amazing Dubai wedding was 2 fun-filled days of laughter, tears, madness and lots of dancing. 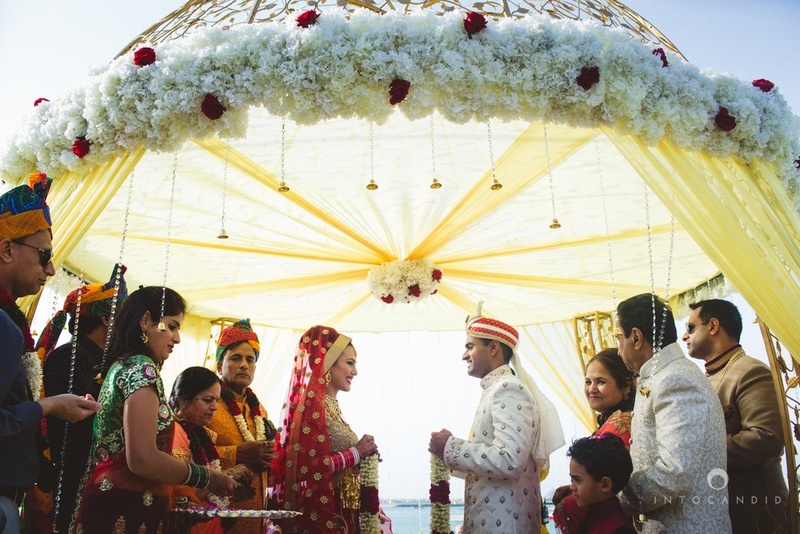 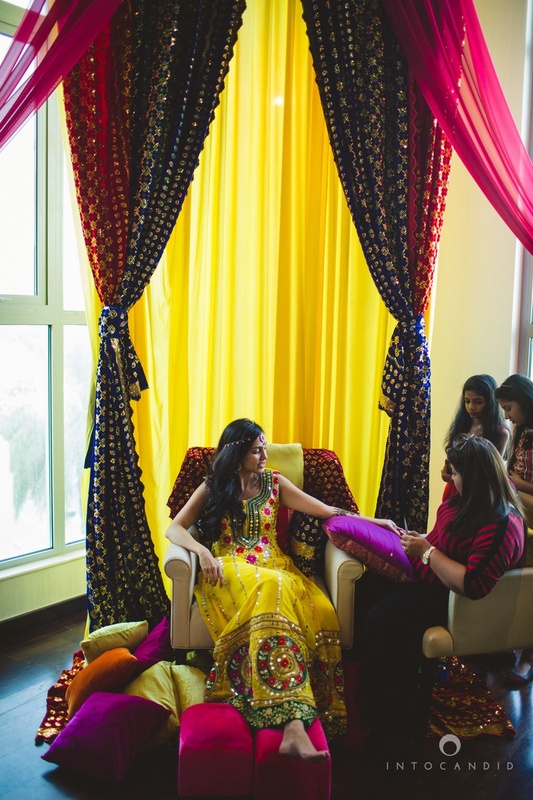 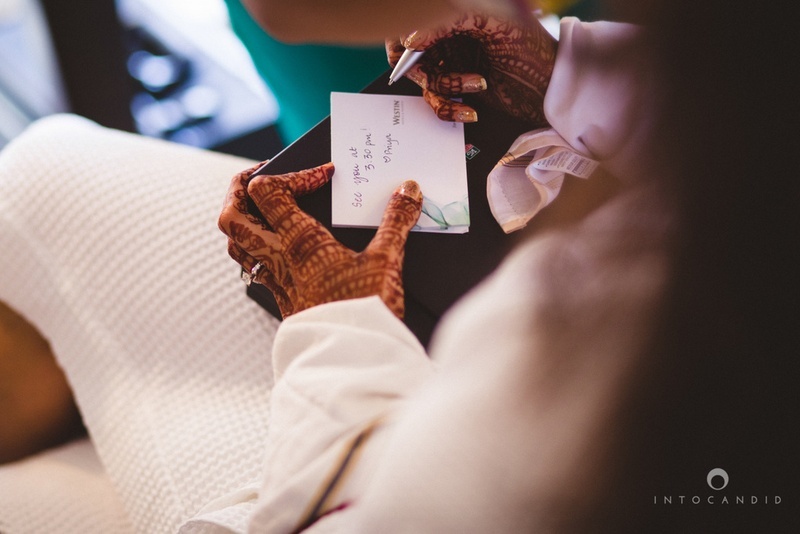 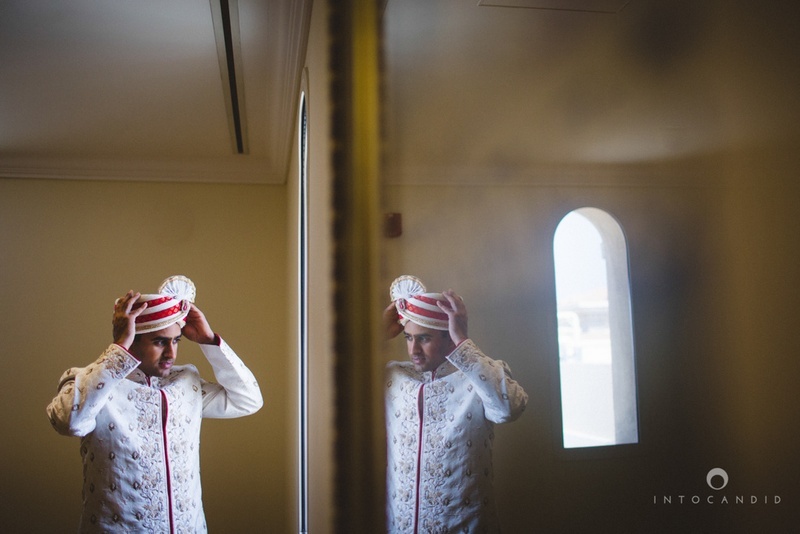 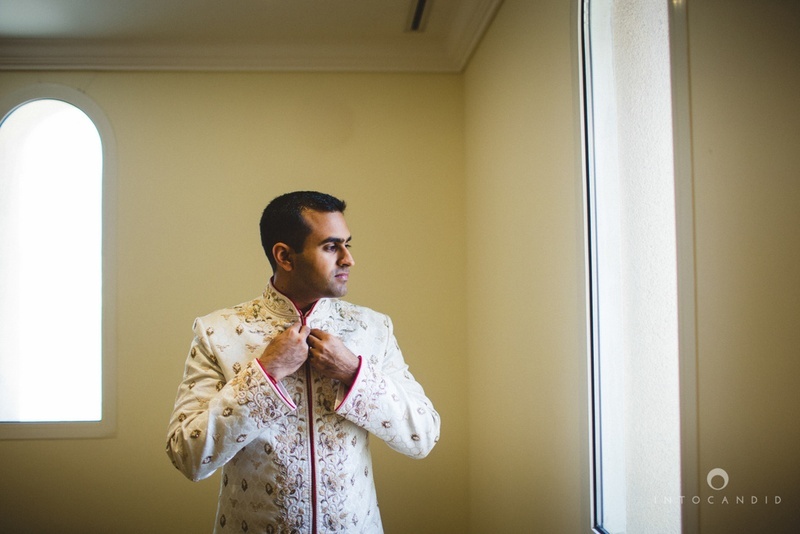 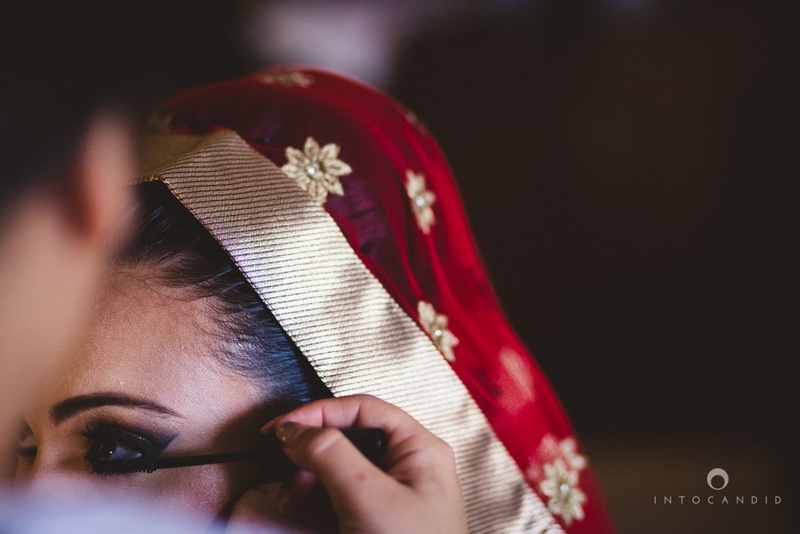 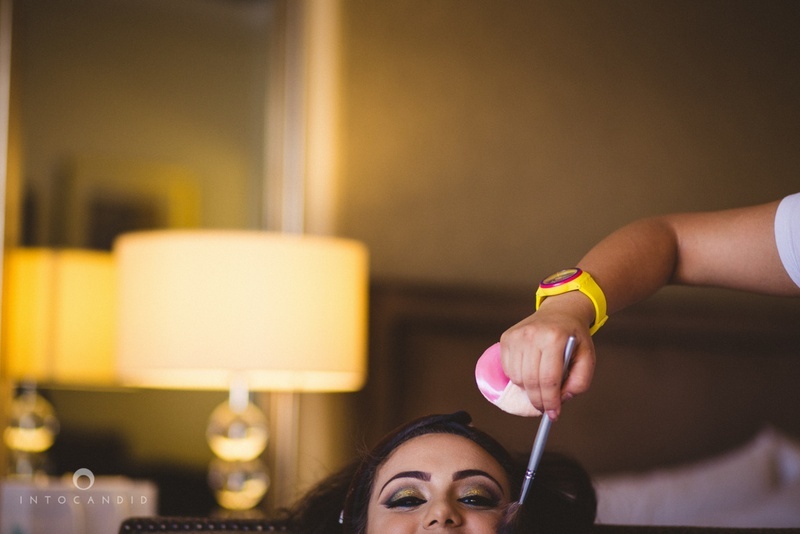 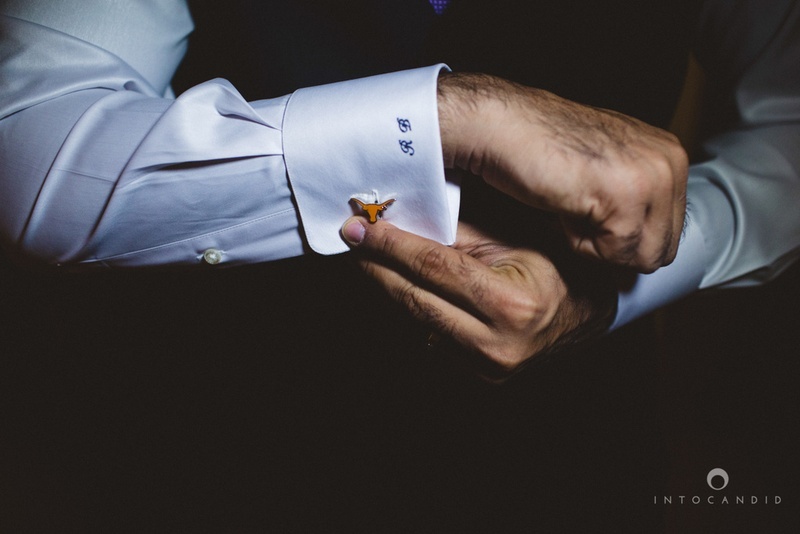 The pheras took place at The Westin, followed by wonderful moments during the ceremony. 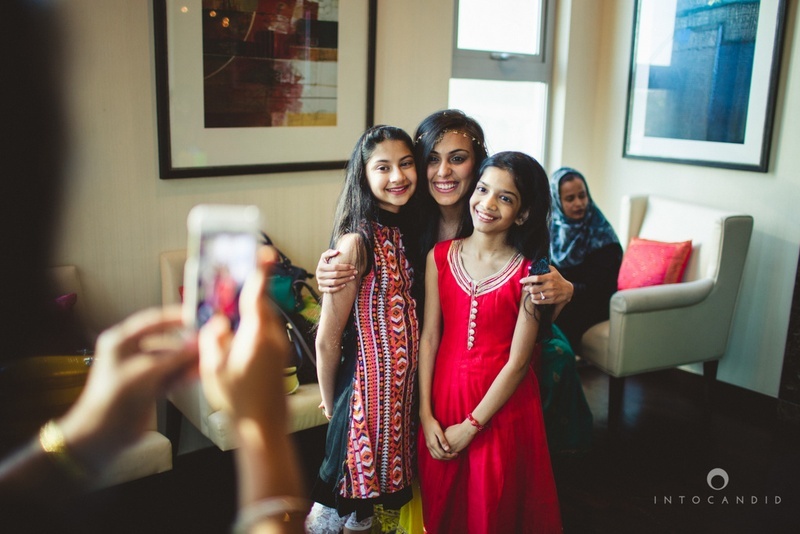 One of the highlights of the day was 3 of their friends performing live for them. 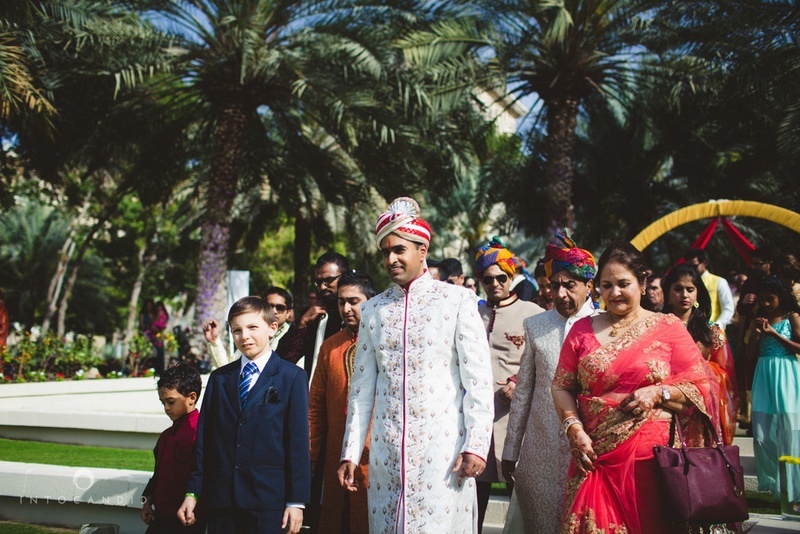 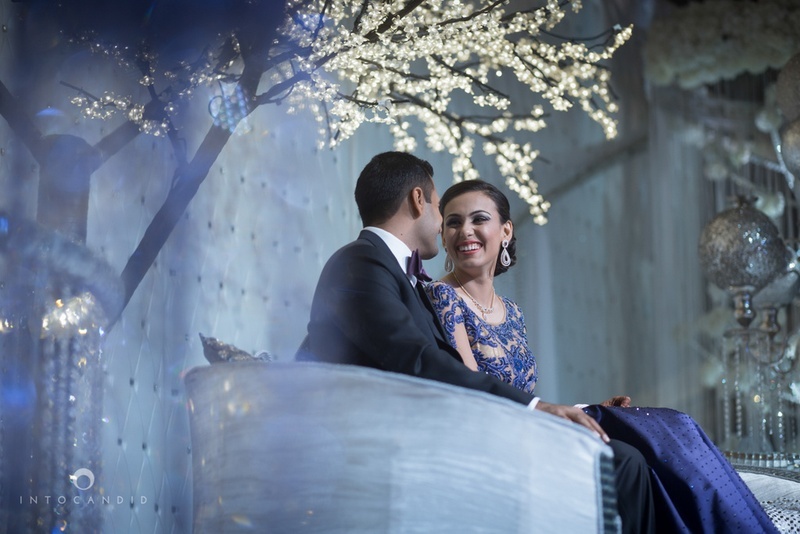 Their Reception was held the next evening at Ritz Carlton, DIFC, Dubai. 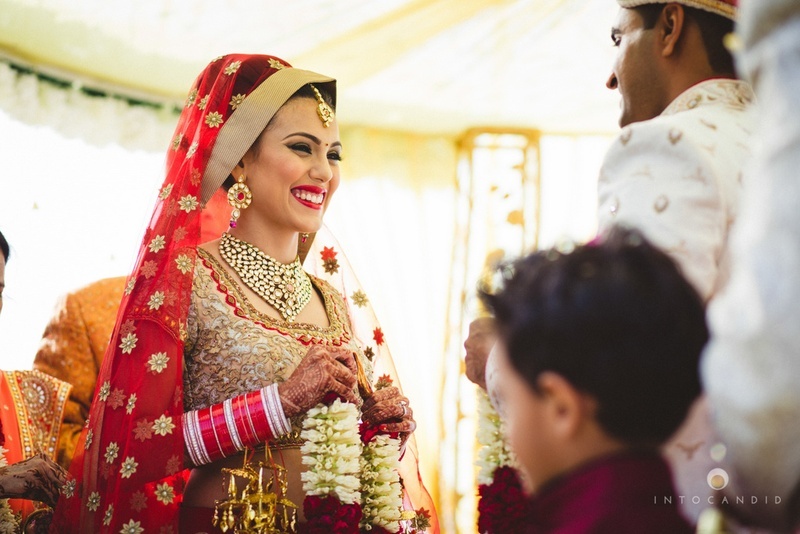 What to look out for: Priyanka's stunning sheer, red wedding dupatta, her diamond choker-style neckpiece and the winter-wonderland reception decor! 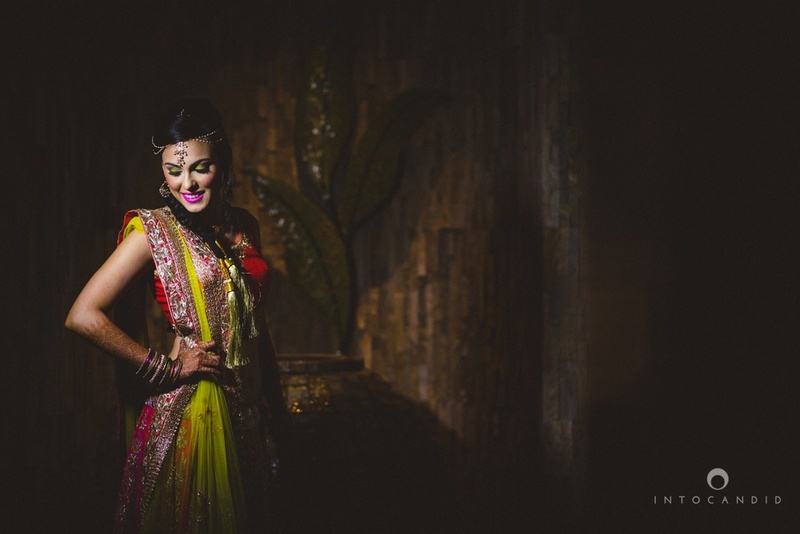 Bridal outfits by Aza, Siyonnah and Priya Chhabria. 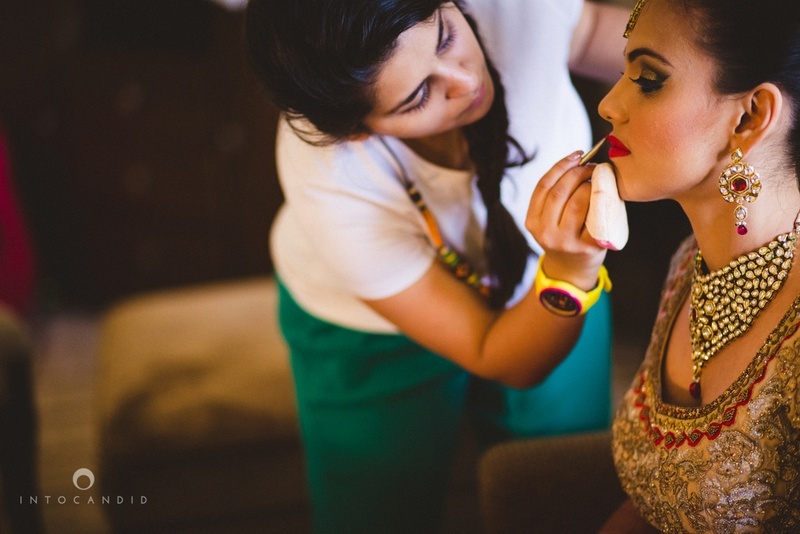 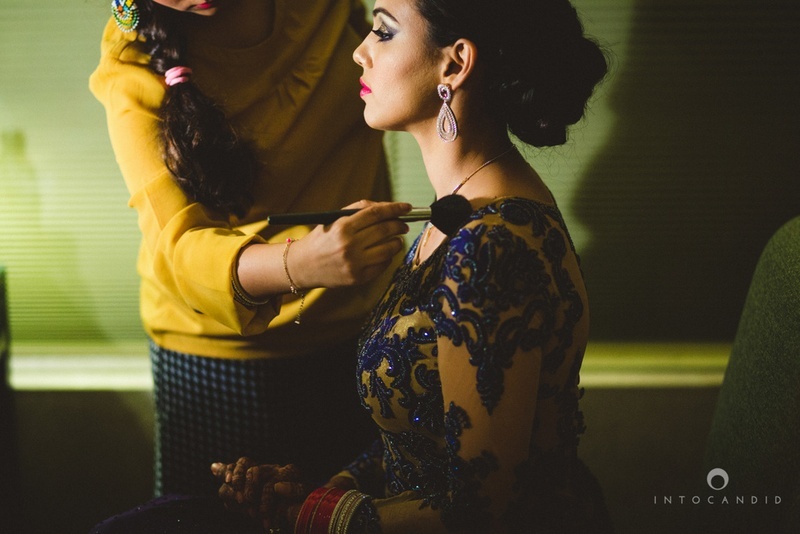 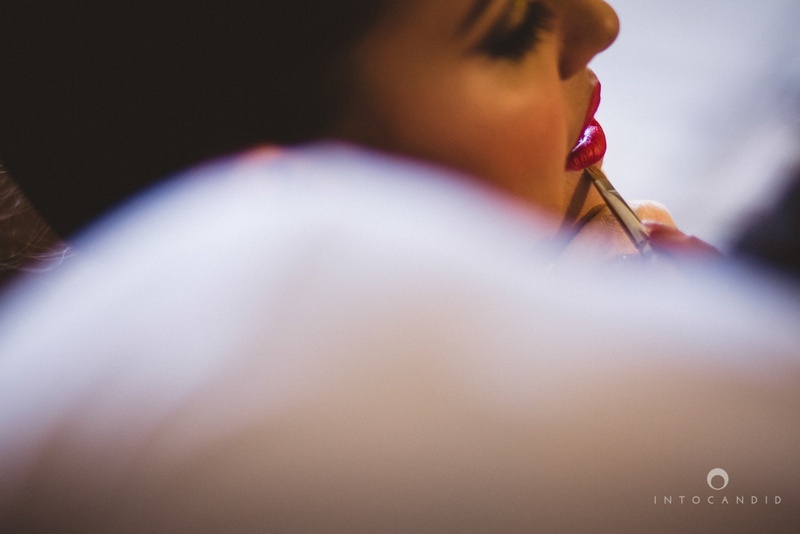 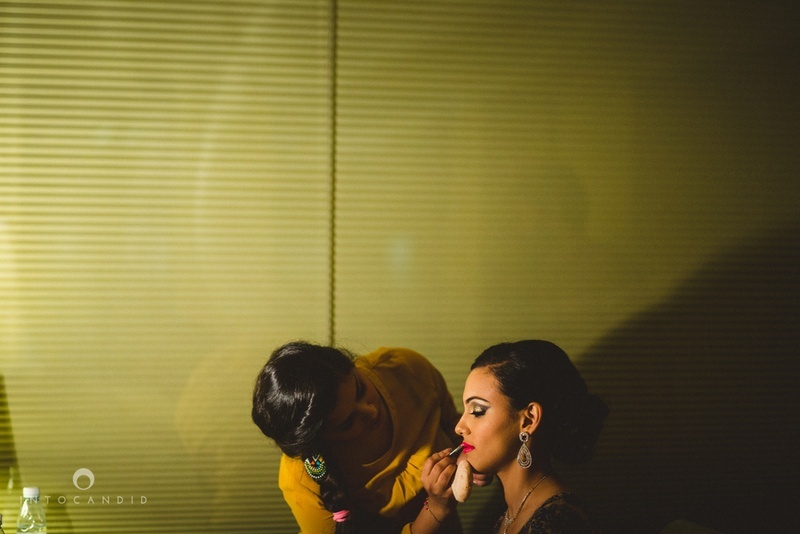 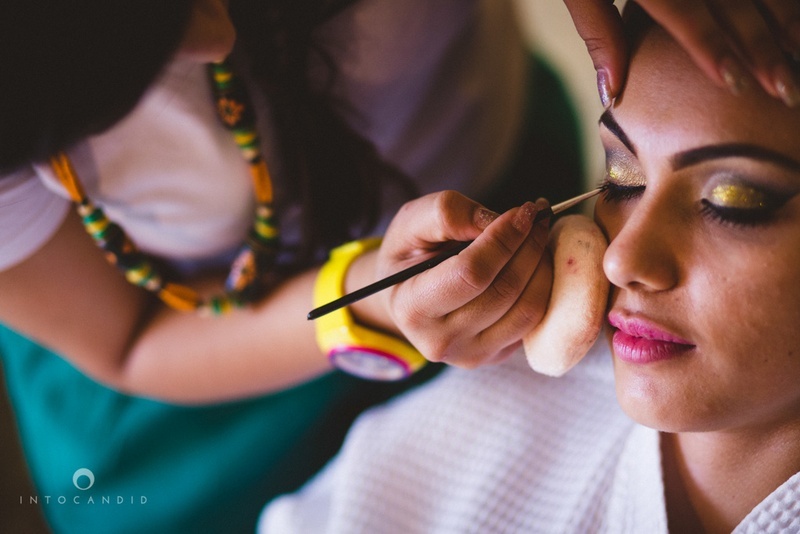 Bridal makeup by Nikita Sharma Dubai. 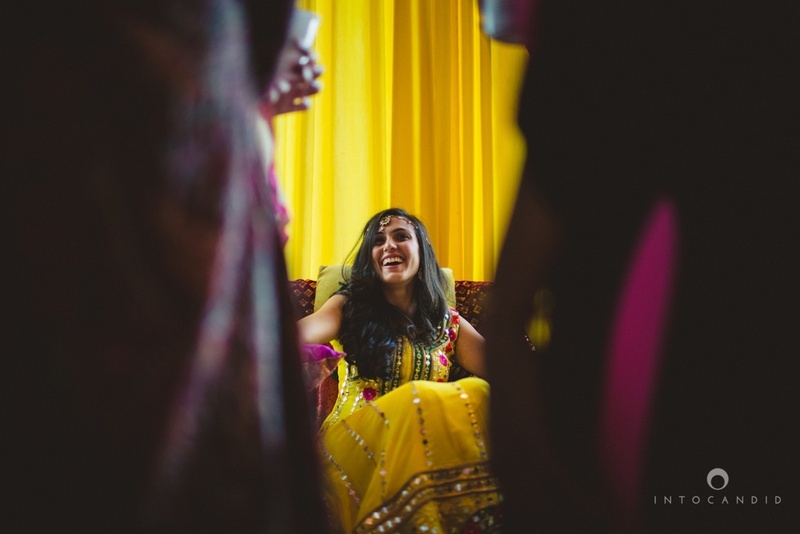 Captured brilliantly by Into Candid Photography . 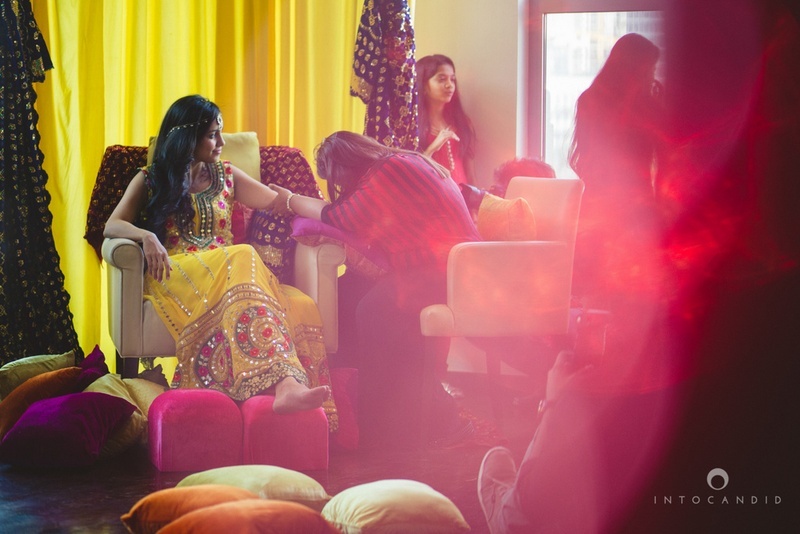 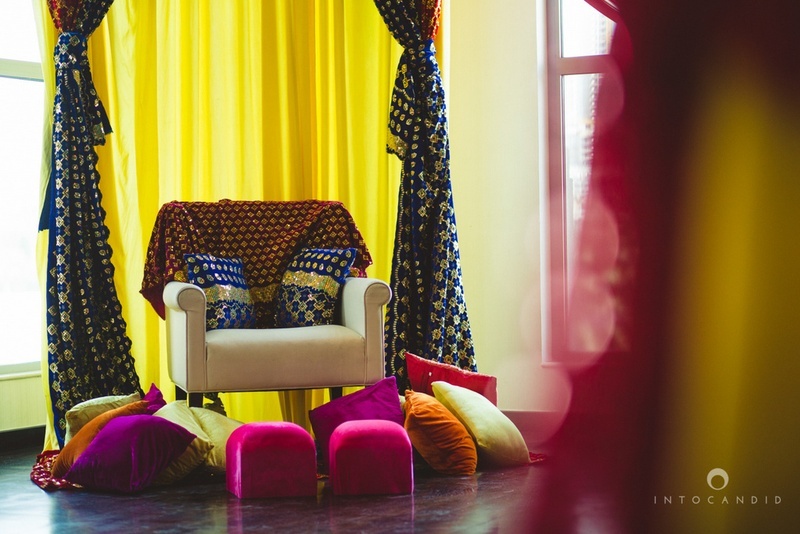 Colorful decor for the mehendi ceremony. 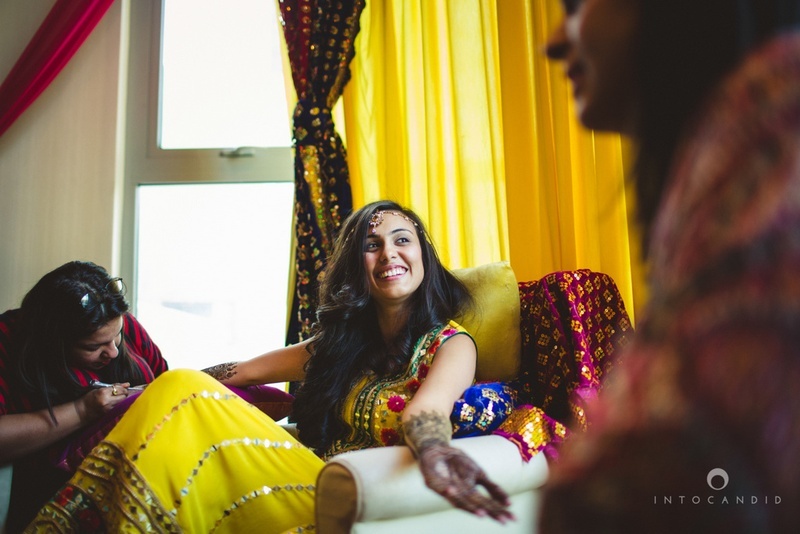 Wearing yellow anarkali with colorful embroidery for the mehendi ceremony. 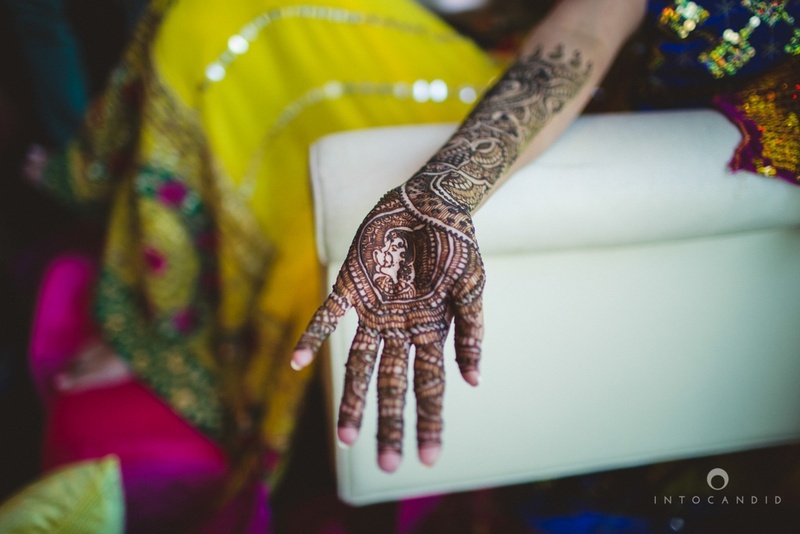 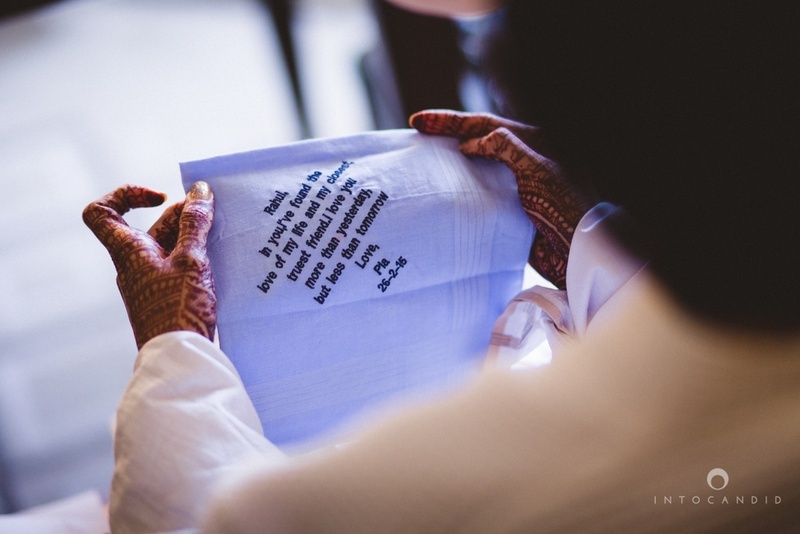 Hand filled with intricate mehendi designs. 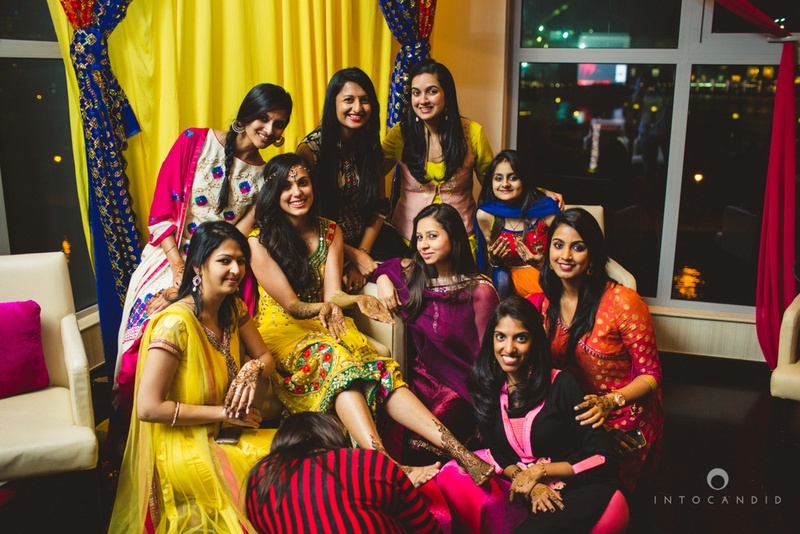 Bride and her bridesmaids on mehendi day! 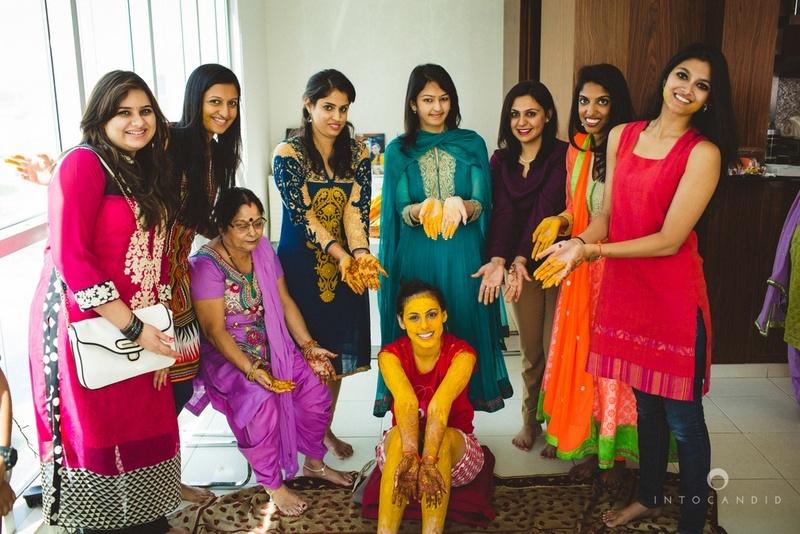 Bride with her girl gang on haldi ceremony day. 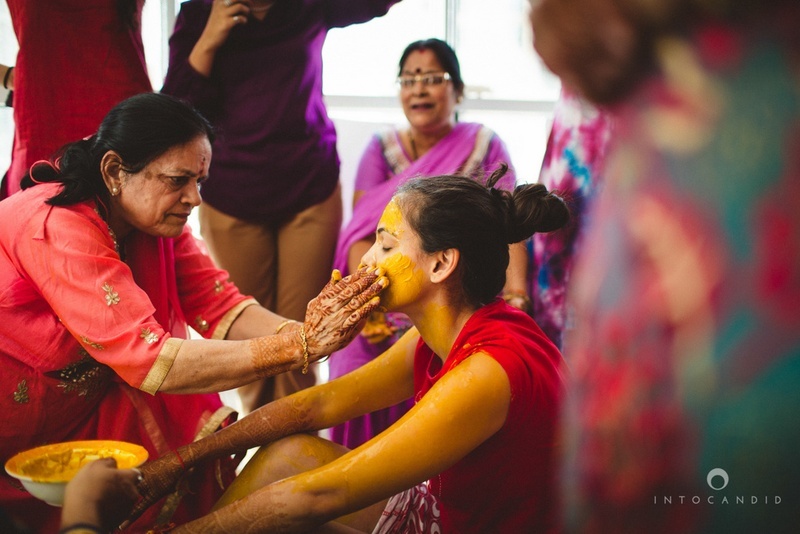 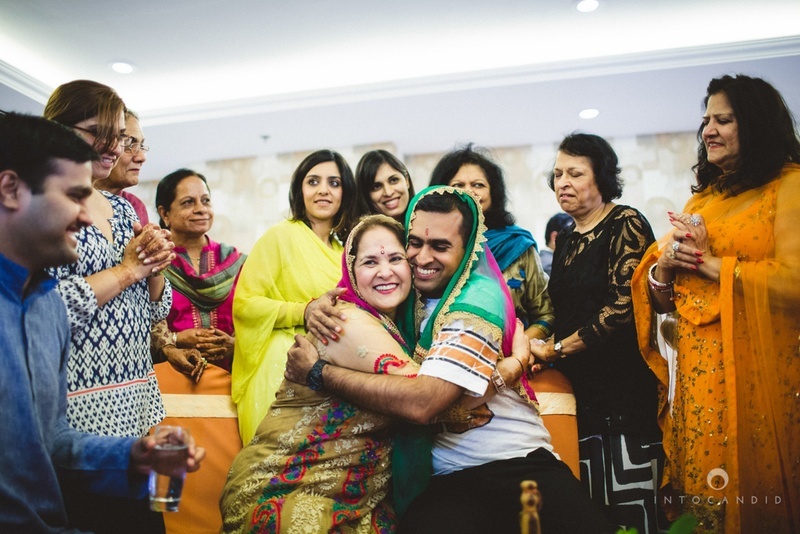 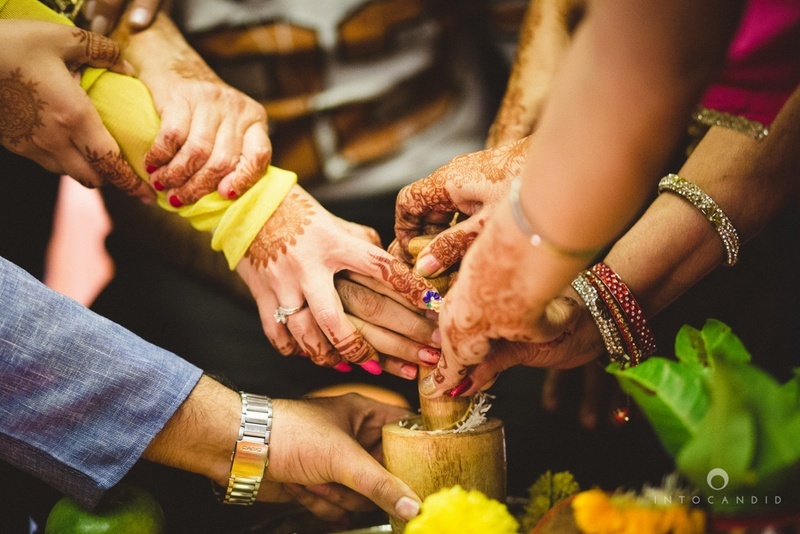 Haldi ceremony at groom's side. 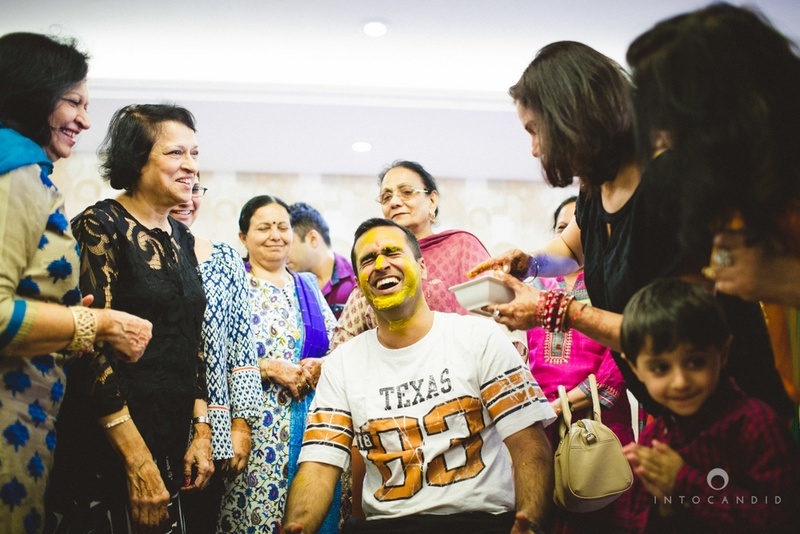 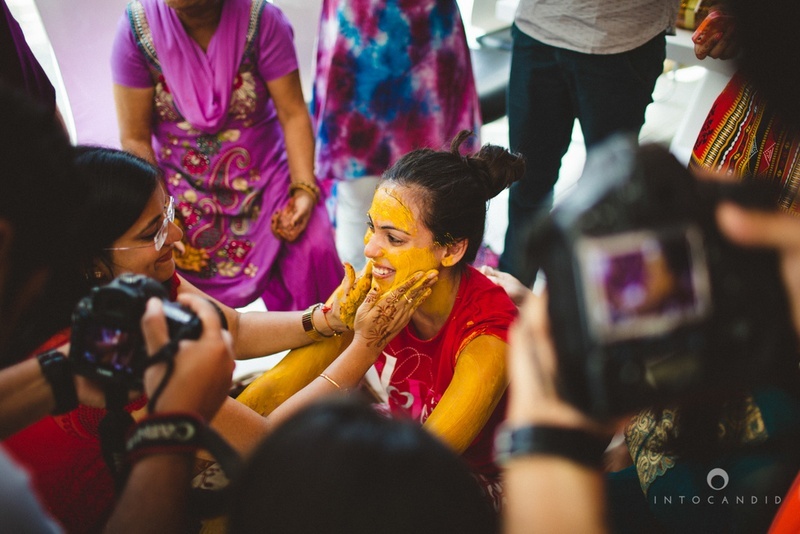 Groom's face drenched in haldi paste. 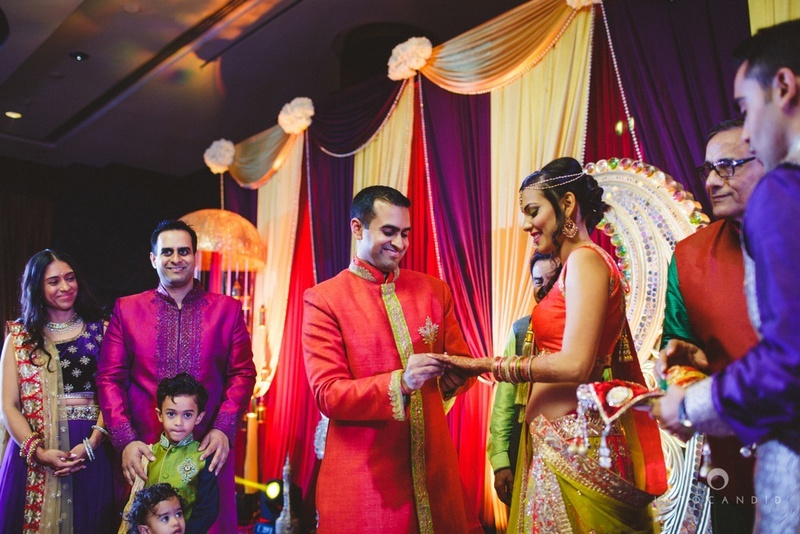 Decked up in beautiful orange and green lehenga styled with minimal jewellery for the sangeet ceremony. 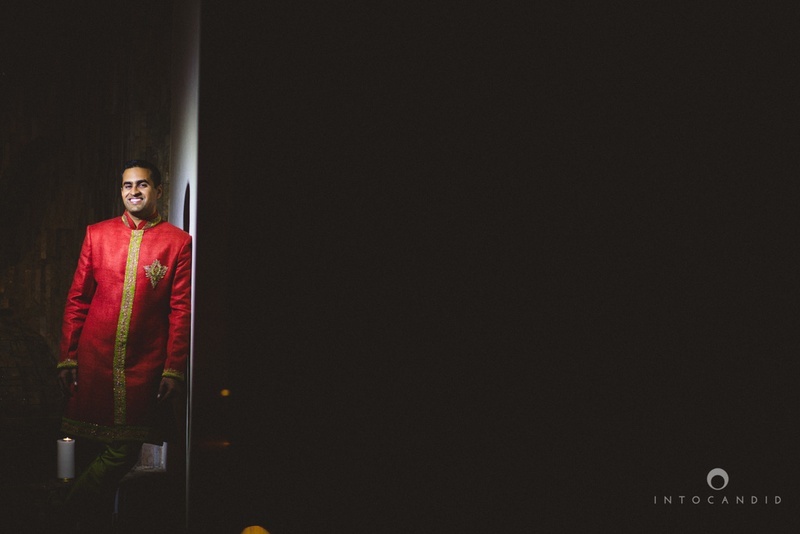 Rahul decked up in an orangish red band gala for the sangeet ceremony. 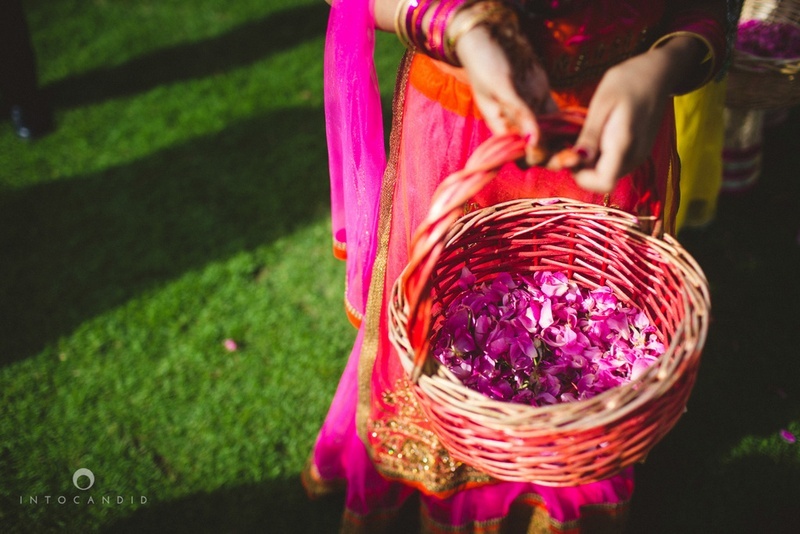 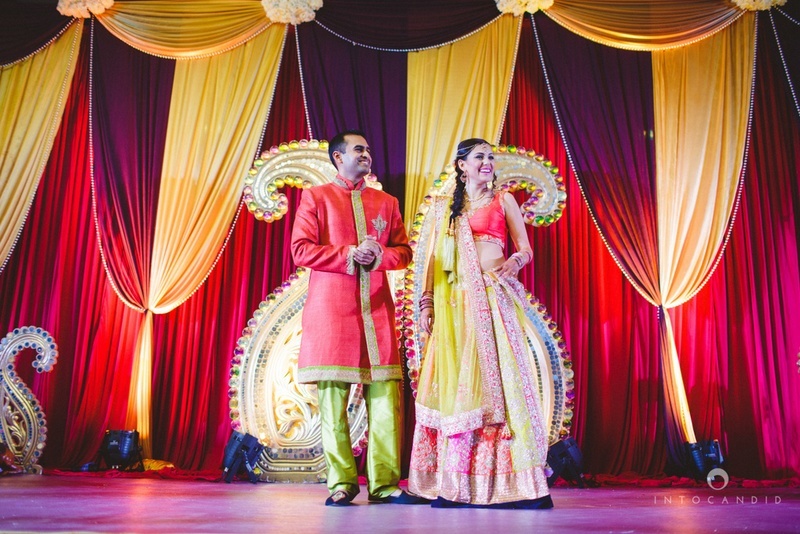 Color coordinated for the sangeet ceremony. 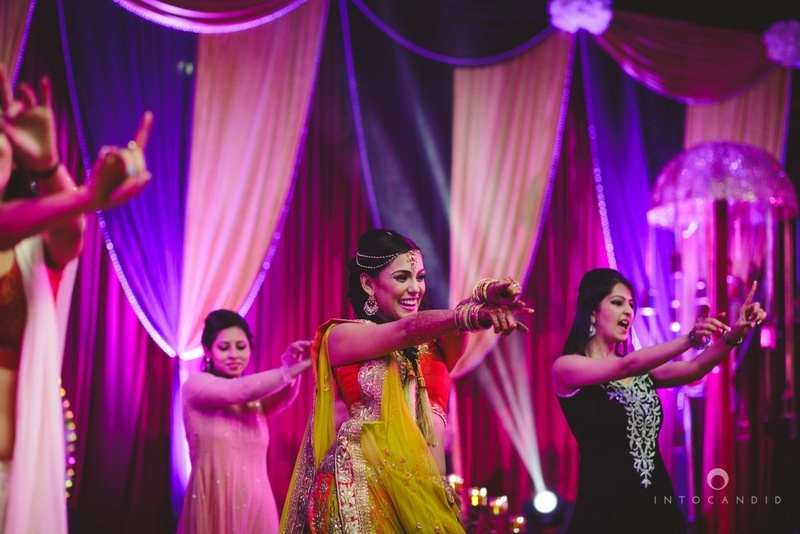 At a performance with the bridesmaids. 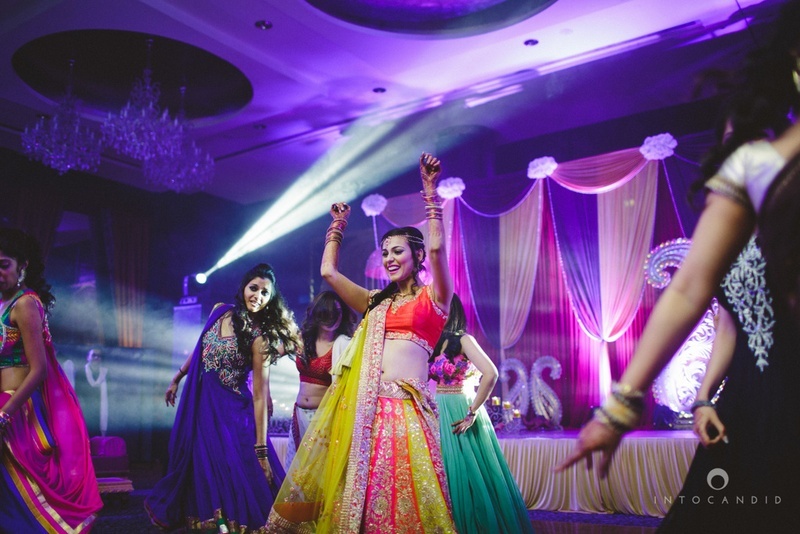 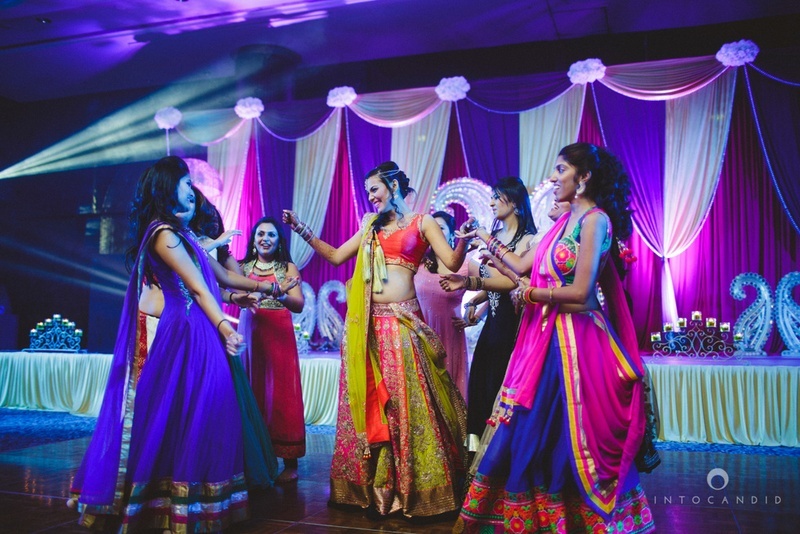 Sangeet ceremony girl gang fun! 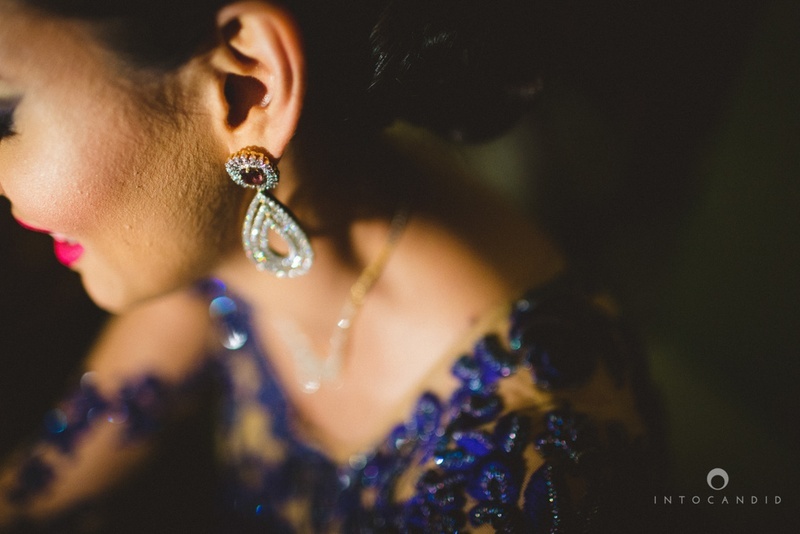 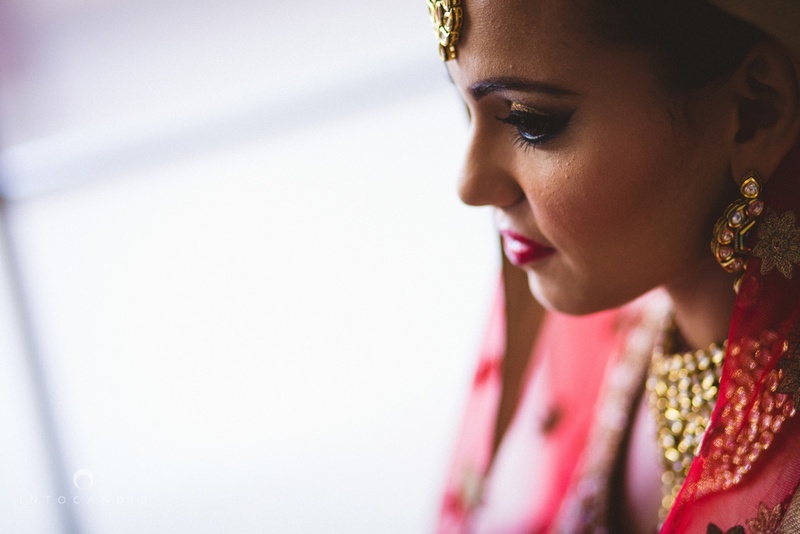 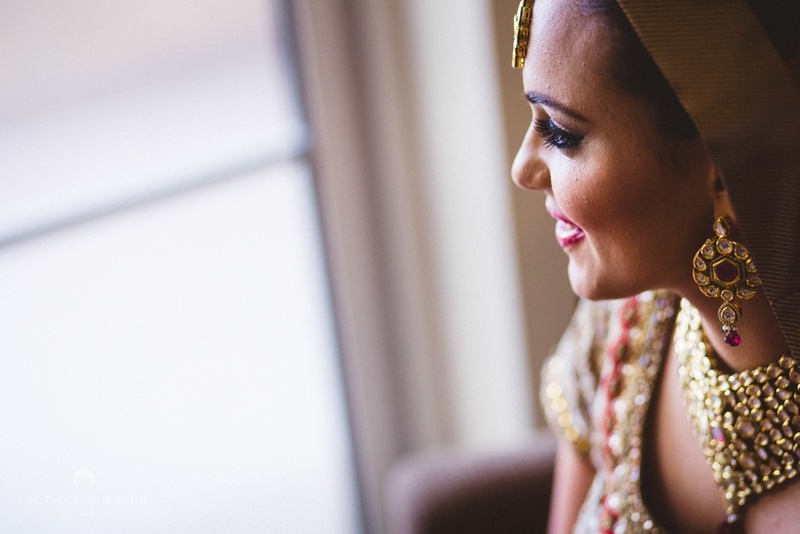 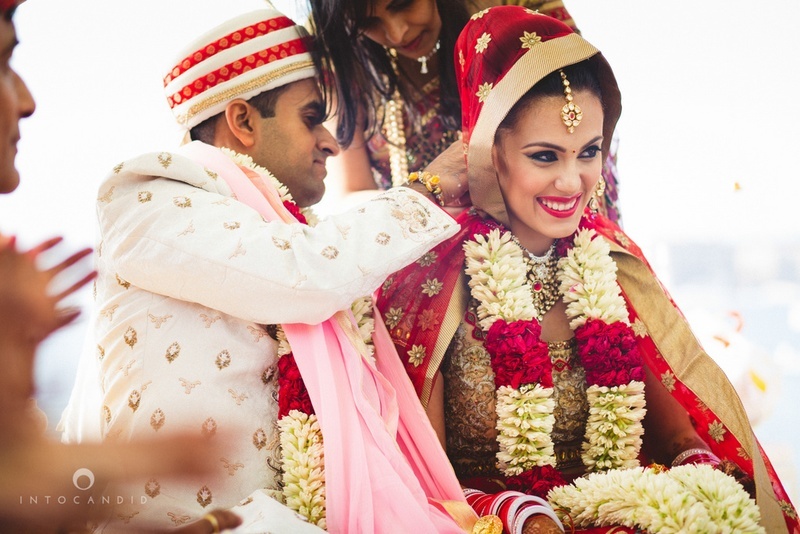 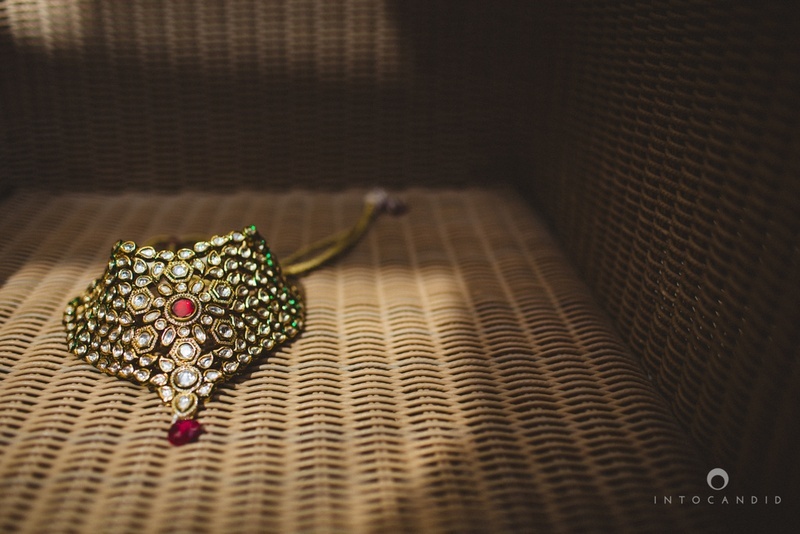 Bridal kundan neck piece photographed by Into Candid Photography. 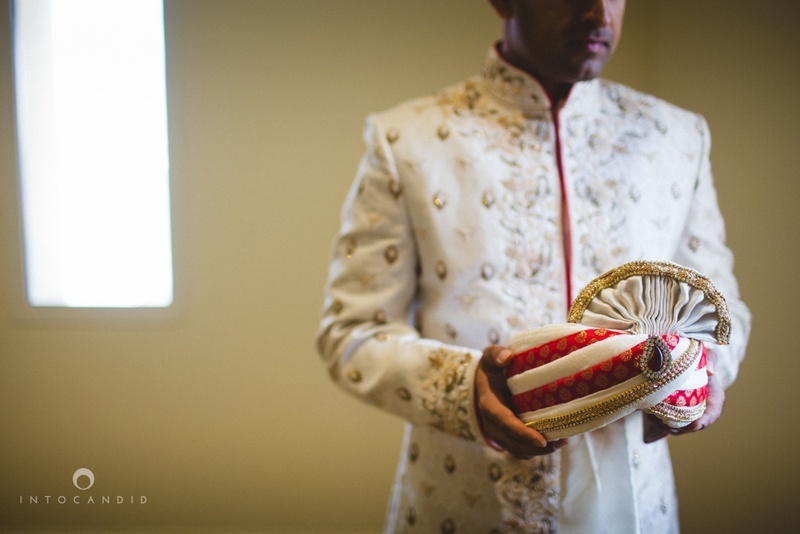 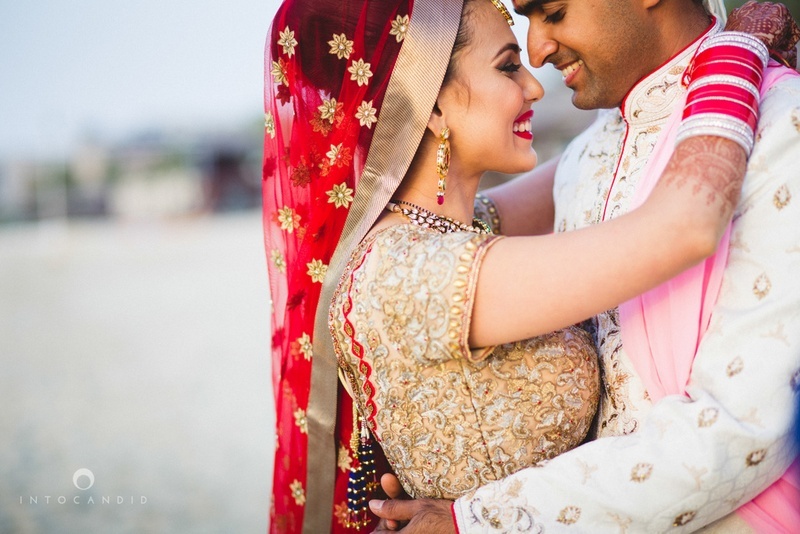 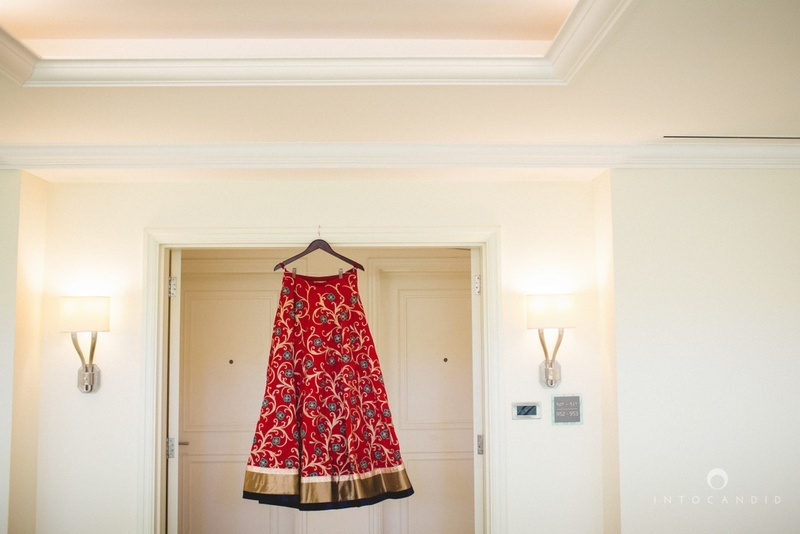 Decked up in a pretty red and gold lehenga by Aza for the wedding day ! 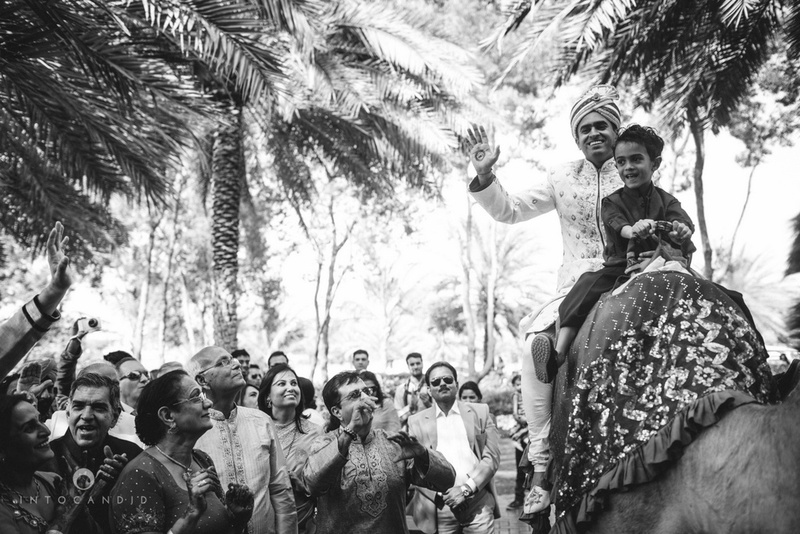 Baraatis arriving at the wedding venue. 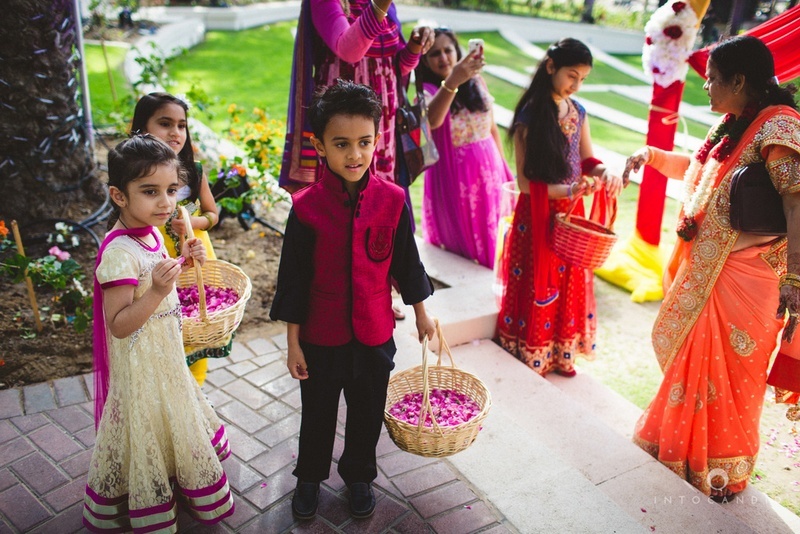 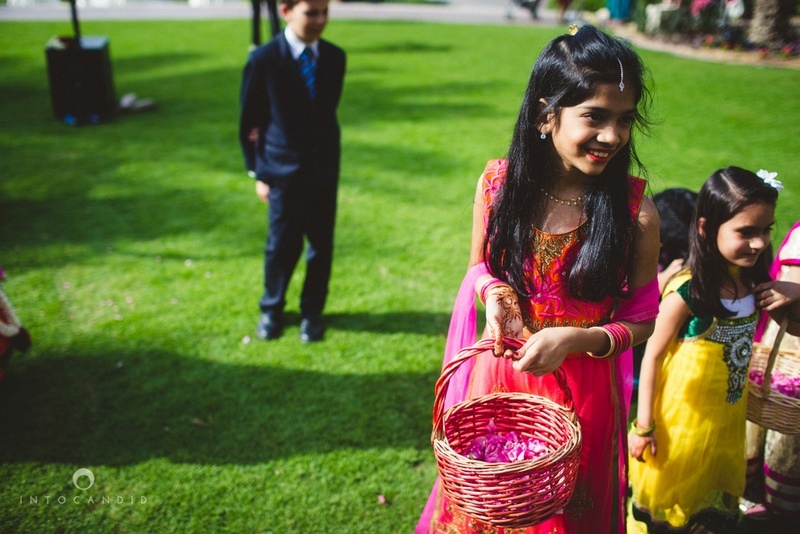 Cute kids at wedding holding flowers to welcome the bride. 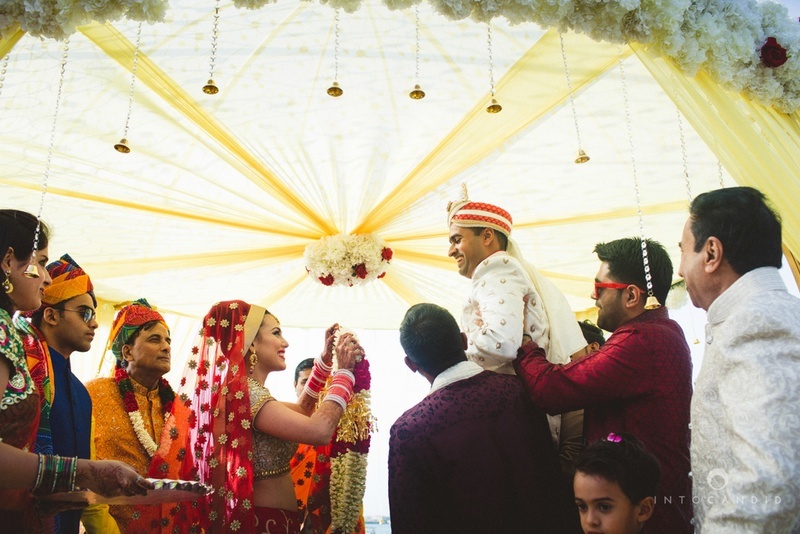 Bridal entry under the phoolon ki chaadar. 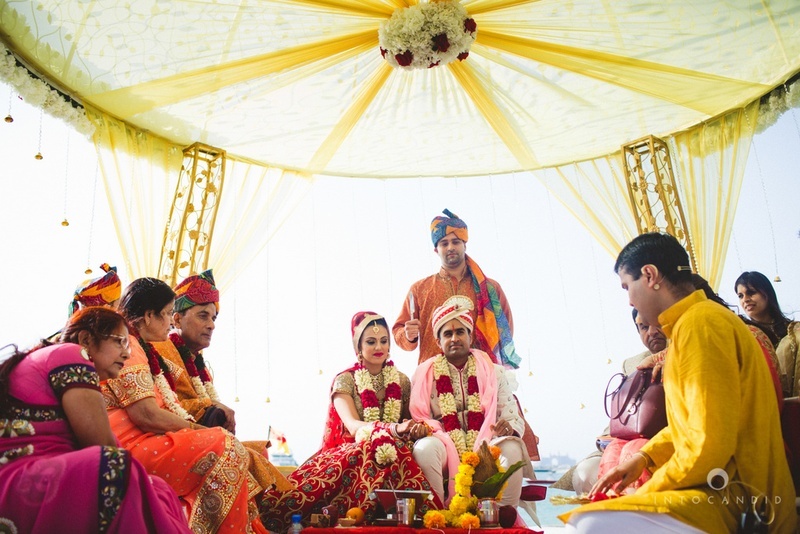 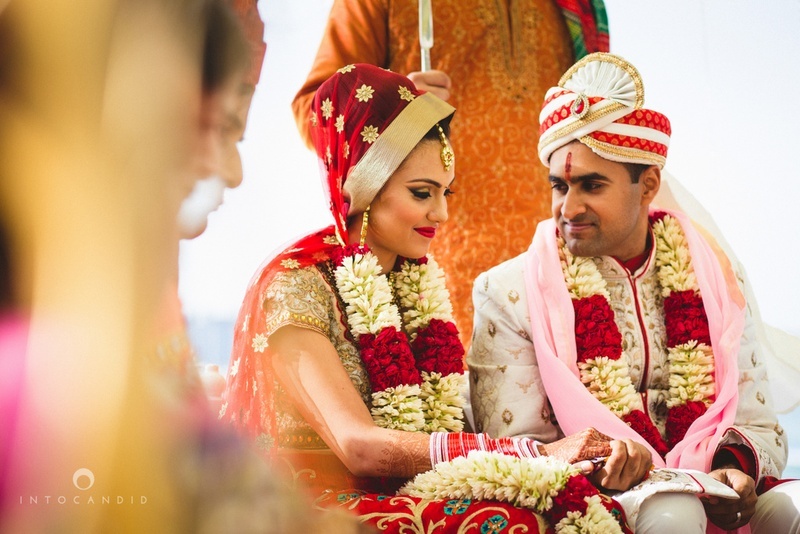 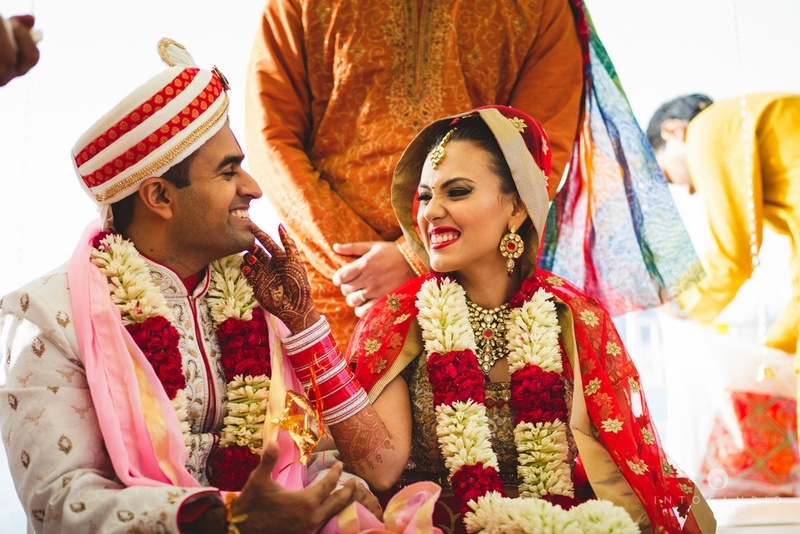 Cute wedding couple decked up in beautiful flower garlands. 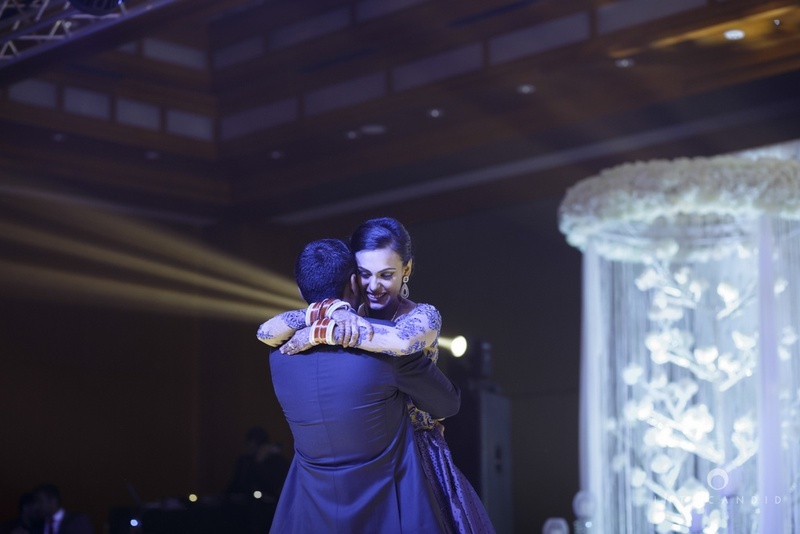 ..and they lived happily ever after ! 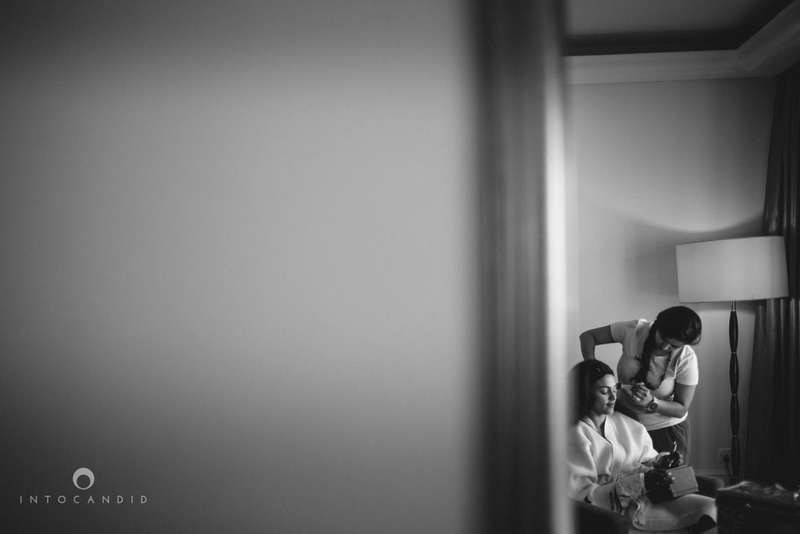 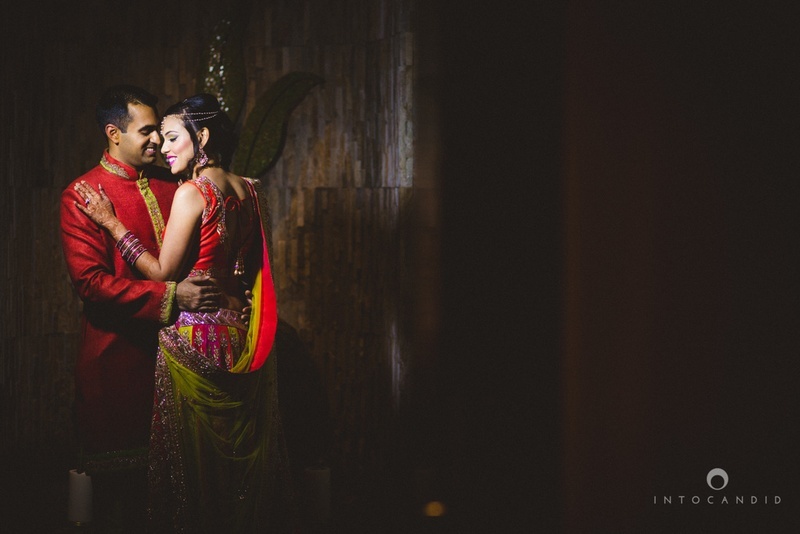 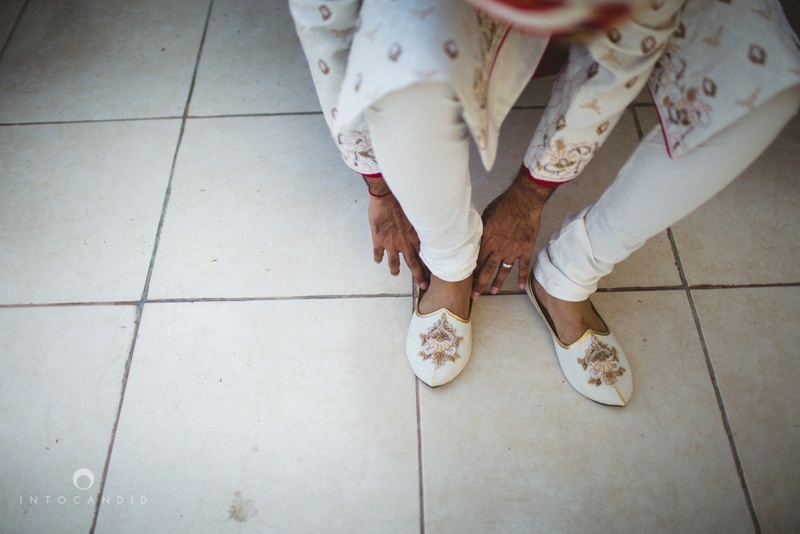 Post wedding couple shoot by ace photographer Into Candid Photography. 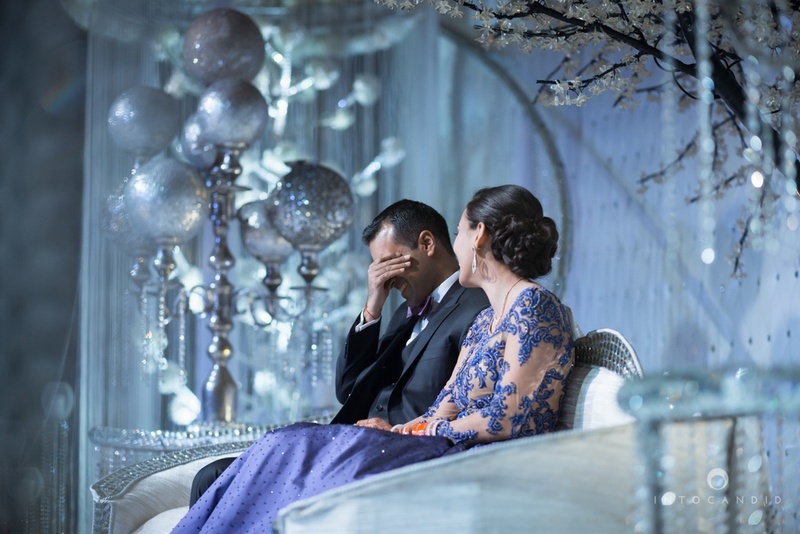 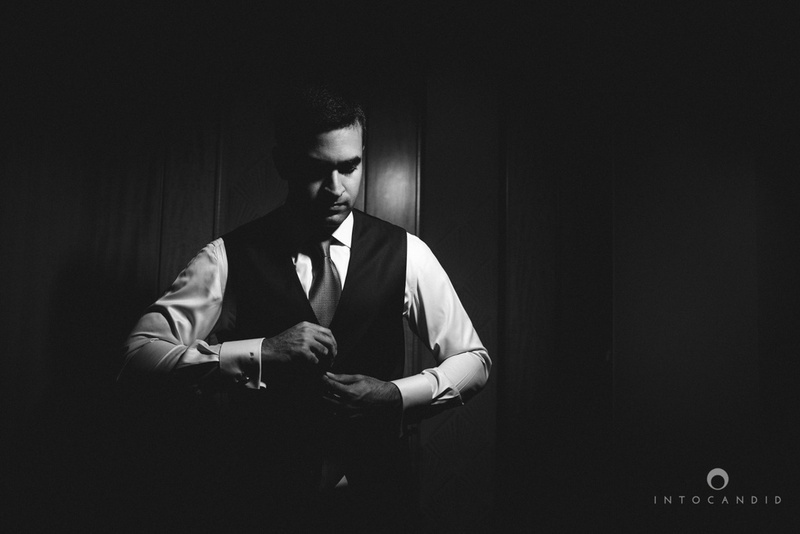 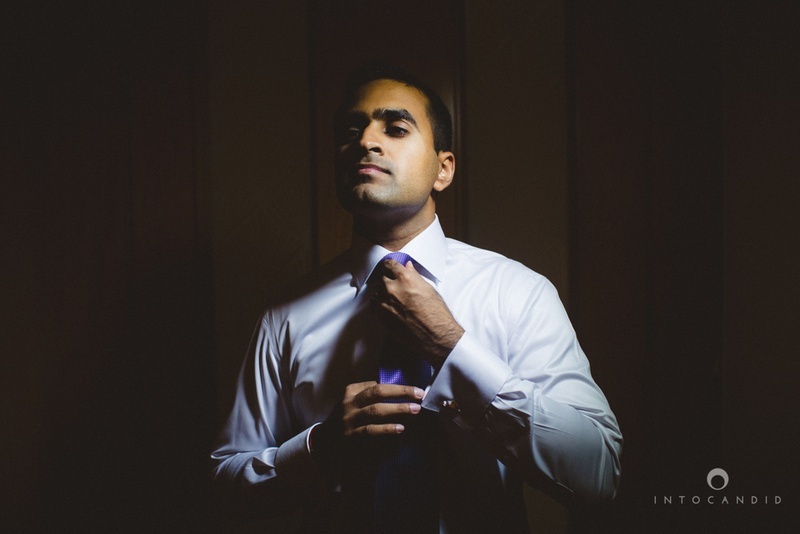 Post wedding photoshoot by Into Candid Photography. 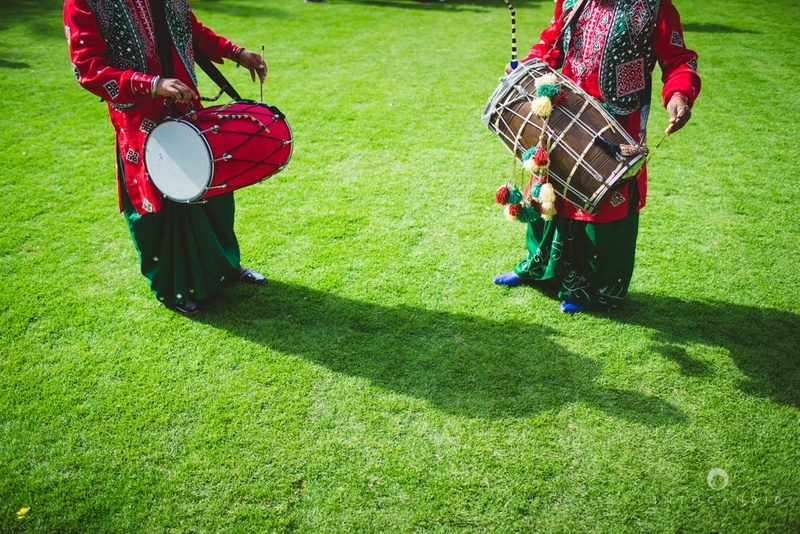 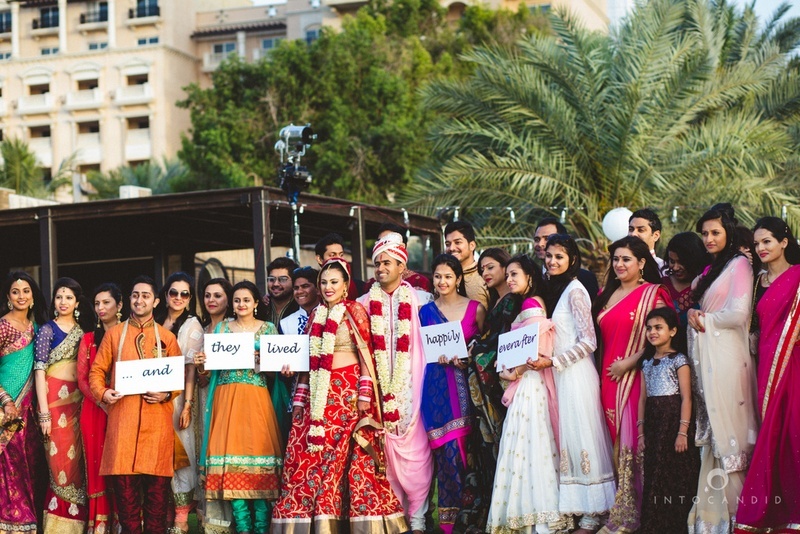 Dressed up in color coordinated outfits for the wedding reception held at Ritz Carlton, Dubai. 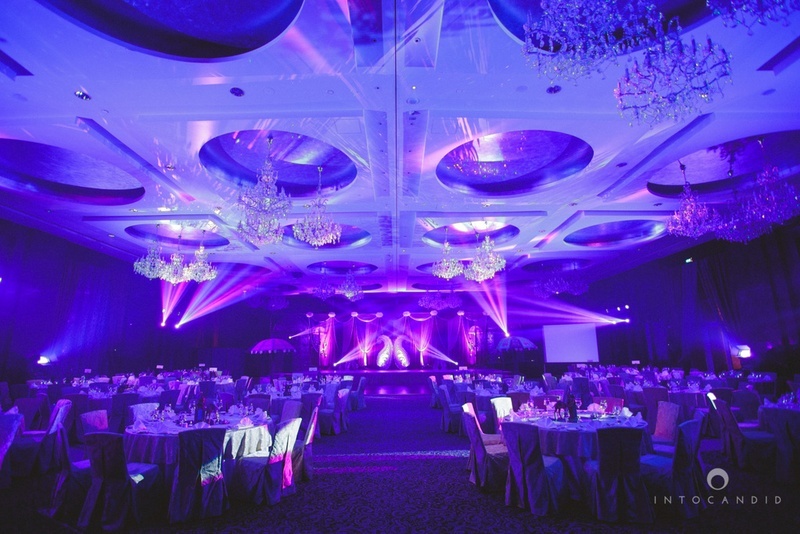 The wedding reception venue decorated with blue lights . 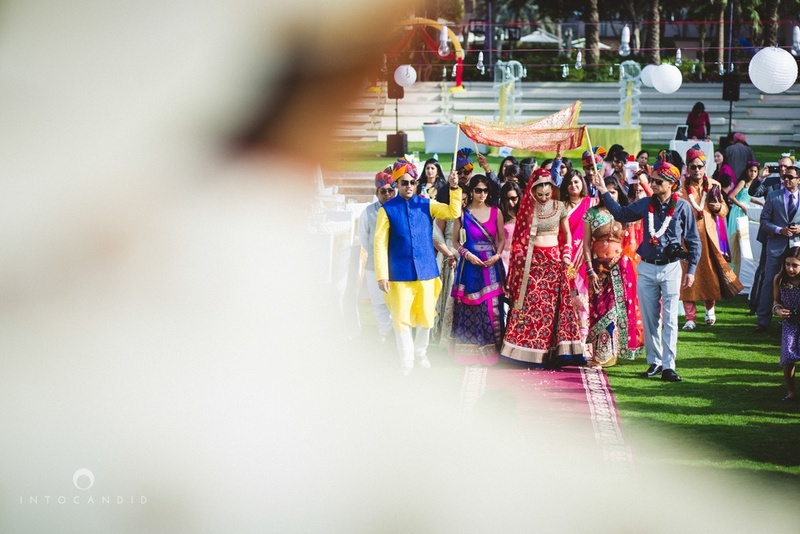 Bride and groom entering their wedding reception . 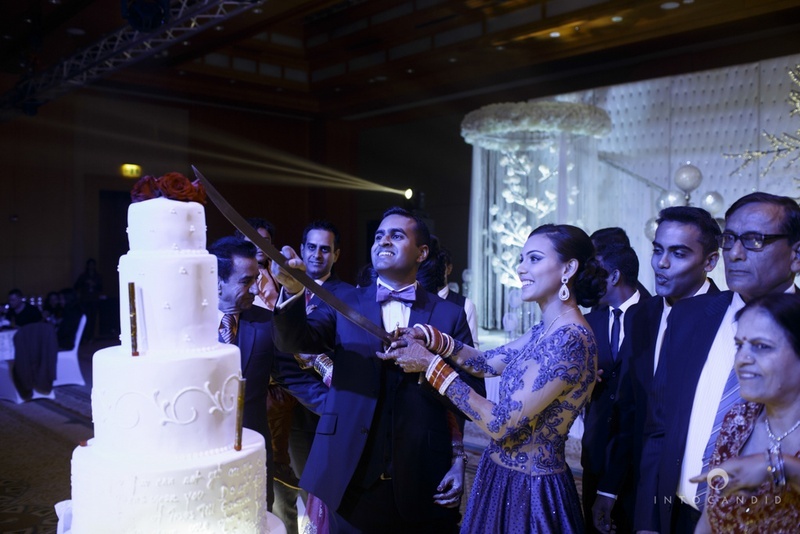 Cutting the big white wedding cake.